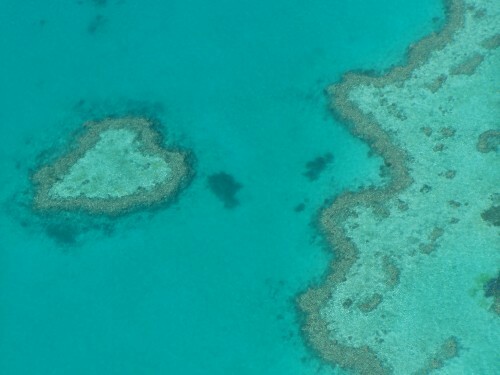 Nothing like a Valentine's day snorkel on the Great Barrier Reef to distract me from the fact it would have been Mat and my 8 year anniversary. So there I was, on the 'Ocean Free' a beautiful sailing ship, sailing out of Cairns for two hours to make my way to Green Island. The skies were blue, the sea was calm, the sun was beating down on me and I couldn't be happier. I met so many interesting people on board - the pilot from Holland who told me about all the heart attacks he had had during his 15year career and the babies he has helped birth, the Swiss pro wrestler who wanted to turn his hand to bull fighting, James - Assistant director on Inception, The Dark Knight, An Education, Sherlock Holmes and just wrapped up on Sherlock Holmes 2, Stuart the 73year old art curator and IT specialist who owned a gallery in Soho in New York and a metal hip and Bob and Jessica from Kentucky who had met up in Cairns just for Valentine's Day. So many interesting people! The crew were so friendly and kept us laughing all the way out there and all the way back. Robbie the skipper/pirate sailed us effortlessly out by using nothing but his feet. He stood on the wooden steering wheel to get enough height to look out to see. So seafaring! After a couple of hours of travelling we moored up and dived in. I can't even begin to describe how beautiful it was down there. We saw turtles, rays, the whole cast of 'Finding Nemo' and even a few jelly fish... cauliflower jellyfish which I was told were harmless only after I had swam over and under it. After a smorgasbord of culinary delights for lunch Rob took us on his little speed boat to Green Island where we wondered around looking at a 14ft long Crocodile named Cassius and the 'wall of gore'. A wall dedicated to croc attacks with very graphic photographs of limbless people and whole bodies being pulled out of captured crocodiles. Worth a glance but I did find myself standing much further back from the crocs in the enclosure after that. I am quite fond of my feet. After an hour on the island just playing with the sand and the fish, pirate Rob came back to collect us and take us on board for another hour or so of snorkelling fun. We sailed back to some John Butler trio, the wind in the sails, a complementary class of wine, a platter of fruit, cheese and biscuits and hilarious conversations. To top it all off I was not sea sick once! BONUS! Once on dry land I waved goodbye to my salty friends and spent some time wondering around Cairns as I would not be seeing it again before leaving. Cyclone Yasi may well have been a dream because Cairns seems untouched and unfazed by the whole thing. A few trees by the shore looked little more bent over then usual but I enjoyed my walk and was pleasantly surprised. VERY touristy but fun for a short period of time. The only thing that ruined it slightly were all the dressed up couples carrying roses, holding hands and slobbering all over each other. I was close to twating someone but the sunshine, sand and salt in my eye lashes kept me smiling. Back at the hostel I met Linda, a lovely Swiss girl who helped me put the world to rights and we curled up in our respective bunk beds talking about love lost and found on a warm Cairns Valentine's Day. Awww.